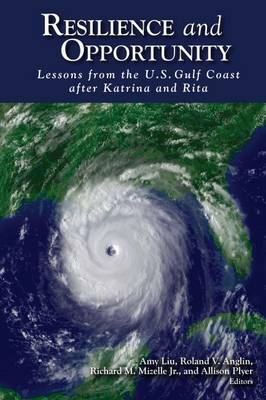 Edited by Anglin, Roland V.
Edited by Mizelle, Richard M., Jr.
Policy analysis performed in the aftermath of Hurricanes Katrina and Rita, which devastated the Gulf Coast in 2005, tends to focus on what went wrong in the post-disaster emergency response. Certainly there are plenty of dispiriting tales to tell about government inaction or perceived incompetence on that front. Such analysis is critically important, of course. This book, however, occupies a different and somewhat more positive niche. Resilience and Opportunity examines the important ingredients in post-disaster recovery, with an eye toward how to rebuild communities that are more resilient and prosperous in the face of multiple disasters. As the people and communities in the Gulf Coast know all too well, catastrophes can come often and in different forms-whether as a major hurricane, a steep recession, or the worst oil spill in American history. It is important to step back and assess the progress and lessons on restoring communities economically, socially, and environmentally, so they can bounce back stronger. Katrina and Rita helped produce in their wake significant policy and infrastructure change, largely by providing opportunity for policymakers, planners, public managers, community leaders, and others in civil society to consider and test innovative ideas. The recent Gulf of Mexico oil spill further heightened the need to strengthen the policies, capacities, and partnerships needed to boost the economic and environmental health and resilience in the region. Resilience and Opportunity shines a light on the important post-disaster recovery progress made since 2005 and the lessons learned. It also illuminates the challenges that remain in recreating the opportunity structures and ecosystem destroyed over multiple catastrophes. Further, the authors look at ways to shore up resilience through long-term planning and stronger community capacities that could preserve or even improve opportunity in the future-not only for the Gulf Coast, but for all communities that are vulnerable to natural disasters or must bounce back from major economic shocks. This book covers the gamut of social and public policies and the roles of different actors needed to remake whole communities-for example, the rise of community engagement and new organizations, redevelopment policy, coastal and wetlands protection, education, criminal justice, the role of philanthropy, and regional leadership. As devastating as the storms of 2005 were, they also produced a teachable moment. Resilience and Opportunity is an important contribution to that teaching process. Amy Liu is a senior fellow and codirector of the Brookings Metropolitan Policy Program. Roland V. Anglin is executive director of the Initiative for Regional and Community Development at Rutgers University's Edward J. Bloustein School of Planning and Public Policy. Richard M. Mizelle, Jr. is an assistant professor of history at Florida State University. Allison Plyer is deputy director of the Greater New Orleans Community Data Center.